Take Fort Dunstad for the Imperials. Pale Imperial Camp, Fort Dunstad, Castle Dour. Get your orders from Legate Rikke at the Pale Imperial Camp. Rendezvous with the legionnaires southeast of Fort Dunstad. Clear the fort of Stormcloak rebels. Report the news to General Tullius. After completing A False Front, report for duty again to Legate Rikke at the Pale Imperial Camp. Having learned that the Stormcloak-held Fort Dunstad is in need of reinforcements, she will command you to help to take the fort while it is vulnerable. She will instruct you to rendezvous with a task force of Imperial soldiers who are staging near the fort, southeast of your location. She will mark the meeting point on your map, and you will update your journal to note this objective. Walk westward out of the camp until you encounter a paved road running north-south. This can be difficult to see when visibility is poor. If you see it, turn left onto it; otherwise, head south from a short distance west of the camp, bearing to the east if necessary to navigate past obstacles. If you are following the paved road, you will pass two rocky areas to your left. There is an easily found iron ore vein in the second of these. You will soon reach another paved road. Turn left on this. After a moderate distance, the road will take you on a significant descent down the mountain. Keep your eye on the paving stones to avoid losing your way. Eventually, the pavement will end at a T-intersection with the major road running between Whiterun and Solitude. Turn right onto this, heading upwards again. Follow this road generally south, around a few bends alternatively to the south and east, until you come upon the task force. As you approach the waiting soldiers, they will charge toward the fort. Your objective becomes to take it over from the rebels. As your team engages the Stormcloaks holding the fort, you will receive regular updates on the percentage of enemies remaining. The entire battle will take place in the exterior areas of the fort. If you have not yet developed an eye for distinguishing between Imperial friendlies and rebel enemies, the Stormcloaks are easily identified by their pointed helmets. The battle will comprise multiple pairs and small clusters of engagements, with both sides using melee weapons and archery attacks. These engagements occur at multiple points in the two courtyard-like areas, and along the elevated wooden platforms around the semi-perimeter. If you let them, your group will essentially take care of the battle for you. If you hang back and take the most passive approach to the fight, you may need only to restore your health once or twice when you are targeted. If you want to prioritize acquiring weapons and armor off of fallen soldiers, you should search them quickly because their bodies will disappear shortly after falling. When it's reported that all the rebels have been killed, you will have completed the objective of taking the fort. 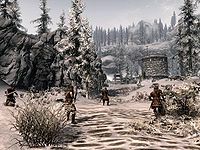 Often, there are actually one or two Stormcloaks remaining (or respawning) after the battle has been formally won, which you can engage and loot. Also, if you so wish, you may kill the remaining Imperials as well in order to loot them without getting a bounty. Your objective then becomes to report to General Tullius at Castle Dour to receive your reward, but doing so technically occurs under the overarching Reunification of Skyrim quest. After you have taken the fort, The Battle for Fort Dunstad will clear from your journal. While General Tullius will say he is giving you a blade, you will actually receive a leveled shield as a reward. You will also be promoted to Praefect of the Imperial Legion. If Dawnstar is given to the Imperials during Season Unending then this quest will not be given. At levels 40 and above, the shield you receive will be random but heavily weighted towards a simple Banded Iron Shield. At levels 40-47, there is a 5% chance of receiving a Dragonplate shield; at level 48 and above, this changes to Daedric. If you approach Legate Rikke (relocated to the Rift Imperial Camp) prior to returning to General Tullius then she will award you with a leveled amount of gold. Sometimes you can travel to the Pale Imperial Camp and there will be a quest marker in the camp itself, which does nothing on approaching it. ? This can sometimes be fixed by waiting for a few hours at that location. Eventually, Legate Rikke will arrive and the quest marker moves to her. You can then approach her and continue the quest. If you kill all the guards outside the fort before you are given this quest, and take the quest during the time it takes the guards to respawn, the quest will be bugged. Imperial soldiers won't appear near the fort, and the whole fort is going to be empty. On the quests page, you won't be able to press the button to show the quest location on the map and it will say you have failed to meet the Imperial soldiers and you have to take the fort yourself, with 100% remaining, except there are no soldiers in the fort. ? Open the console and type setstage CWFortSiegeFort 10. This should force the Stormcloaks and Imperials to spawn. To fix this you will have to complete the quest using the console command completequest CWFortSiegeFort and then getting the quest from Rikke. You can also advance the quest to completion with console command setstage CWFortSiegeFort 9000 which advances the attack on the Fort to success and updates the objective to report to Tullius. This can also occur even if you have never been to the fort. Imperial soldiers won't appear near the fort, the whole fort is empty, and on the quests page you can't press the button to show the quest location on the map. If the Fort Dunstad quest is bugged, continuing the Season Unending quest in the main storyline will set The Battle for Fort Dunstad to complete. The quest updates when you get both Ulfric Stormcloak and General Tullius to agree to attend the peace council. Sometimes Stormcloaks will get stuck in place. They will not always or be able to attack you. 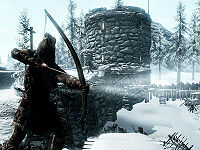 You can not attack them either 15 ebony arrows at point blank range proved this. They are unkillable. ? There is a work-around you must open the console and use the kill command this will work. 10 Legate Rikke has sent me to assist in taking Fort Dunstad from the enemy. 9000 Finishes quest We have succeeded in taking Fort Dunstad from the enemy. This page was last modified on 17 March 2019, at 20:21.